��Obama�s lack of knowledge and experience in the American Culture is very apparent in his �I WILL NOT NEGOTIATE� statements and posture. .... if this 'shutdown' is indicative, imagine what Obama and his Democrat Party could [will?] do to bring any opposition to heel when they control the entire healthcare system and don't get their way? �.AP-GfK Poll- Most Americans disapprove of the way Obama is handling his job, the poll suggests, with 53 percent unhappy with his performance and 37 percent approving of it. Congress is scraping rock bottom, with a ghastly approval rating of 5 percent�. The so-called ‘Budget Crisis” is demonstrating the pettiness and vindictiveness of our President. Obama’s lack of knowledge and experience in the American Culture is very apparent in his “I WILL NOT NEGOTIATE” statements and posture. I grew up in an era when government and civics were taught in school. Even in Grammar School, we learned about three branches of Government: Legislative (Makes Laws and Appropriates); Executive (Executes Laws and Command Military); Judicial (Interprets laws and decides conflicts). To hear President Obama discussing the current shutdown, one would think he has unlimited dictatorial powers. For some time, I have felt that Obama was influenced, if not controlled, by the Chicago Culture of Corruption. It is amazing to me that the media and public have not seen through it. Unfortunately, the so-called MSM (Media) is in the tank for him and just ignore so many stories that reveal Obama’s true colors. I did not have much confidence in the benefit to the GOP or nation in a government shutdown. However, as it reveals more and more of the Obama Way, it may serve a valuable purpose. ….Vaillancourt was one of thousands of people who found themselves in a national park as the federal government shutdown went into effect on Oct. 1. 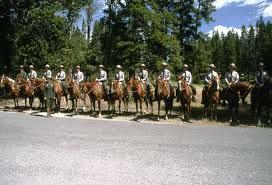 For many hours her tour group, which included senior citizen visitors from Japan, Australia, Canada and the United States, were locked in a Yellowstone National Park hotel under armed guard. Via William Jacobson, NBC's affiliate in Washington, D.C. reports that police ordered tourists and Vietnam war veterans who were visiting the Vietnam Veterans Memorial Wall to leave the memorial at one point on Friday. After one group of veterans went around the barricade, "the park ranger told them the wall was closed," NBC's Mark Seagraves reported. "Later another group of vets showed up and moved the barricades. At that point, the memorial filled with vets and tourists. That's when police came and moved everyone out." The Obama administration has been very selective in devoting resources to shutting down memorials……..
War memorials are being barricaded left and right — outdoor structures that are not staffed to begin with — and Obama even ordered the ocean closed. The ocean. The National Park Service was ordered to close 1,100 square miles of the Florida Bay to fishing boats, and rangers have been sent out to stand post and enforce the closure. Officials even went so far as to demand that orange cones be strategically placed so people can’t pull over their cars and view Mount Rushmore from the highway. ….It’s pretty clear that the “shutdown” is a highly selective process; in other words, it’s a complete joke. The lengths this administration has gone to in trying to heighten the public’s pain during what is essentially a faux shutdown is pathetic. It’s like one of those movies starring CG animated talking babies, except those babies are our political leaders and this is America’s shameful reality. Case in point: the shutdown drama has reached such a lamentable level of absurdity that #SpiteHouse has become a new Twitter trend and Obama has earned the nickname ‘President Stompy Foot’….. While our president still enjoys his essential employees and locations: the White House chefs, Camp David, and a military golf course, there doesn't seem to be any question that in mercenary pursuit of a political win, this White House is determined to unreasonably punish as many everyday people as possible. And this includes children sick with cancer. That might sound like hyperbole, but it is not. Although Barack Obama's chefs have been deemed "essential," employees at the National Institutes of Health who offer last-chance experimental cancer treatments for children suffering from cancer have not. Worse still, House Republicans have offered to compromise with the president and single the NIH out for funding. The White House has threatened a veto. Using children sick with cancer as pawns is community organizing on steroids. And the media are covering for him. When the media thought they could emotionally blackmail the GOP with these sick children, telling their story was all the rage. Now that it is Obama and Senate Democrats wrist-flicking refusing treatment for these children, suddenly the media aren't too interested in telling their story. There are many other examples of this president's cold-hearted fanaticism and willingness to punish people for reasons that seem to have much more to with spite than what is and is not "essential." In fact, there are a number of examples where Obama seems to be spending more money and using more resources to close and block and inconvenience than to just leave it alone. The media may or may not report on these individual occurrences, but what they will never do is provide the American people with the full context and scope of Obama's shrill pettiness. Below is a list of illogical, unnecessary, and shockingly spiteful moves our government is making in the name of essential and non-essential. This list will be regularly updated, and if you have something you feel should be added, please email me at jnolte@breitbart.com or tweet me @NolteNC. 1. Treatments for Children Suffering From Cancer - The GOP has agreed to a compromise by funding part of the government, including the National Institutes of Health, which offers children with cancer last-chance experimental treatment. Obama has threatened to veto this funding. 2. The World War II Memorial - The WWII memorial on the DC Mall is a 24/7 open-air memorial that is not regularly staffed. Although the White House must have known that WWII veterans in their eighties and nineties had already booked flights to visit this memorial, the White House still found the resources to spitefully barricade the attraction. The Republican National Committee has offered to cover any costs required to keep the memorial open. The White House refused. Moreover, like the NIH, the GOP will pass a compromise bill that would fund America's national parks. Obama has threatened to veto that bill. 3. Furloughed Military Chaplains Not Allowed to Work for Free -Furloughed military chaplains willing to celebrate Mass and baptisms for free have been told they will be punished for doing so. 4. Business Stops In Florida Keys - Although the GOP has agreed to compromise in the ongoing budget stalemate and fund the parks, Obama has threatened to veto that funding. As a result, small businesses, hunters, and commercial fisherman can't practice their trade. While the feds have deemed the personnel necessary to keep this area open "non-essential," the "enforcement officers" to ensure no business is done are "essential." 5. Obama Blacks Out Sports, Entertainment Programming to Overseas Troops - The American Forces Network (AFN) that provides American sports and entertainment programming to our troops stationed abroad, has been shut down. For some reason, though, AFN News will still broadcast news, just not any of the popular and fun stuff. Camp David is essential, but popular programming for heroes overseas is non-essential. 6. 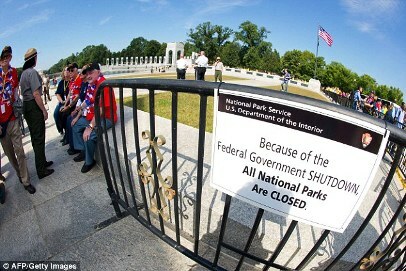 Obama Closes D-Day Memorial - The GOP has offered to compromise and fund the National Parks. 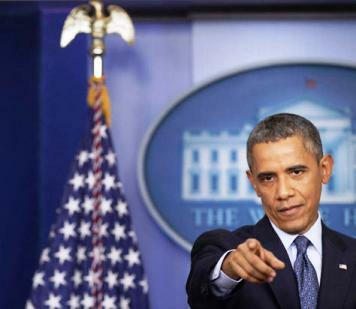 Obama has said he will veto this compromise legislation. As a result, along with 24 other militarycemeteries, the D-Day memorial in Normandy has been barricaded. 7. Obama Tries to Close Privately-Funded Mt. Vernon - Although George Washington's Mt. Vernon estate is privately funded, the feds blocked visitors from entering the parking area because the Park Service maintains the lot. Apparently, the New Media publicity resulted in the feds backing down. 8. Obama Closes Over 100 Privately-Managed Parks That Cost No Money to Run - The U.S. Treasury actually makes money from the rent paid by a private company that "employs about 400-500 camp workers and managers across about a dozen states." No federal money is used to operate these parks. No federal employees are used to staff these parks. Taxpayers make a profit from these parks. Still, Obama had them closed and as a result 400-500 employees and a private business are taking it in the neck. .10. Obama Tries to Close State-Run Parks in Wisconsin - "The park service ordered state officials to close the northern unit of the Kettle Moraine, Devil's Lake, and Interstate state parks and the state-owned portion of the Horicon Marsh, but state authorities rebuffed the request because the lion's share of the funding came from state, not federal coffers." 11. Obama Closes Vietnam Memorial - The GOP have passed compromise legislation that would fund national memorials and parks, and open them to the public. Obama threatened a veto. Apparently, the "essential" government employees are those erecting barricades, not those who could keep the memorial open. 12. Obama Closes Privately-Owned Hotel, Police Block Parking Lot - "The operator of a 51-room inn located on U.S. government-owned land in North Carolina abandoned his defiant stance on Thursday to keep the property open despite being ordered to close as part of the federal government shutdown." October is this inn's prime season. The GOP have offered compromise funding opening the parks. Obama said he will veto that compromise. State troopers blocked customers from entering the inn's parking lot. 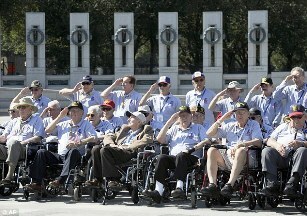 WWII Veterans Insisted on access to WWII Memorial 10.13. 14. Obama Forces Residents Out of Private Homes -"The government shutdown is being felt close to home for some locals. They say they're being forced out of private homes on Lake Mead because they sit on federal land." The GOP has agreed to fund the parks. Obama has threatened a veto. The GOP has agreed to fund the parks. Obama said he will veto. "Restaurant public relations director Molly Yun said they were notified there was a possibility a closure might happen, but they were allowed to remain open during the last government shutdown 17 years ago." The restaurant is part of the federal park system, which the GOP has agreed to fund. Obama said he will veto the funding. 17. Obama Shuts Down a Road That Goes Through CO Park:"The Forest Service announcement, in turn, led the Pitkin County commissioners to order that Maroon Creek Road be shut down at the height of the colorful leaf-changing season. Ahead of what is to be one of the busiest weekends of the fall, the road is to be closed to vehicles at T-Lazy-7 Ranch, pending a resolution to the government shutdown." The GOP has agreed to fund the parks. Obama said he will veto that compromise funding. 18. Residents Plan Protest of Cape Hatteras Closing - "Businesses and residents on the Outer Banks have planned a peaceful protest of the closure of Hatteras Island's beaches due to the government shut down. "The U.S. House Wednesday passed a measure to reopen national parks and monuments. It will now go to the U.S. Senate." In the unlikely event the Democrat Senate passes the bill, Obama has threatened a veto of any compromise legislation opening the parks. 19. Obama Blocks People From LOOKING at Mt. Rushmore - "Blocking access to trails and programs at South Dakota’s most popular attraction was one thing, but state officials didn’t expect Congress’ budget stalemate to shut down a view of Mount Rushmore. 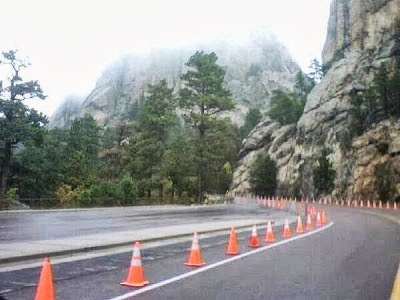 "The National Park Service placed cones along highway viewing areas outside Mount Rushmore this week, barring visitors from pulling over and taking pictures of the famed monument. The cones first went up Oct. 1, said Dusty Johnson, Gov. Dennis Daugaard’s chief of staff. The state asked that they be taken down, and federal officials did so with some of them. The state was told the cones were a safety precaution to help channel cars into viewing areas rather than to bar their entrance." "USDA's total website shutdown goes far beyond the response of other federal agencies, and seems to be part of an effort to make people feel the effects of the shutdown. Thursday morning calls to USDA's press office seeking an explanation were not answered." This website is down and yet the ObamaCare and White House websites are up. 21. St. Louis Gateway Arch Closed - The GOP has agreed to compromise legislation funding the parks. Obama has threatened a veto. 22. Park Shutdown Bounces Rowers from Potomac - "The ripple effect of a government shutdown has pushed rowers from the Potomac River. "Multiple high schools rent space at the Thompson Boat Center in Georgetown. But like other places controlled by the National Park Service, it closed Tuesday morning." The GOP has agreed to compromise funding opening the parks. Obama has threatened a veto. 23.Thompson Boat Center Closed In DC - The GOP has agreed to fund the parks. Obama said he will veto. 24. Obama Closes Military Commissary - "Military members, veterans and families who shop at local tax-free store are shocked to discover the store's doors locked; no progress to end stalemate in Washington." While the government has deemed the White House chefs "essential," working class military personnel have lost their tax-free store privileges. Military personnel and their families tell me that they have never lost these privileges in previous shutdowns. 25. Arizona Offers to Fund Grand Canyon, Obama Says 'Drop Dead' - "Obama has ordered the Grand Canyon to stay closed, even after the state of Arizona and local businesses have offered to cover the costs necessary to keep it open. In other words, the shutdown isn’t about the money — it’s about hurting the American people just because he can."